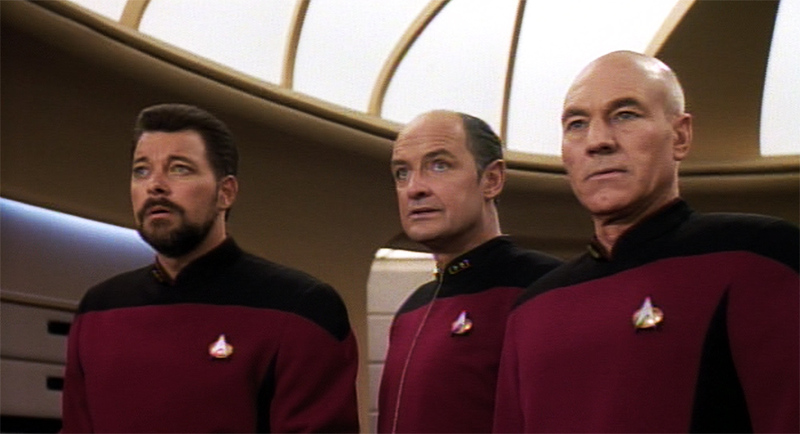 So, here we are, passing the halfway point of TNG‘s seventh season. Will I finish before year’s end? I’m not sure, but even if I don’t, it will be soon enough afterward. “Sub Rosa” is one of those strange things. Even though it is certainly one of the worst episodes in the Trek canon, it has that strange characteristic of being one of the most enjoyably awful episodes of Trek. There’s something to be said for the unintentionally funny. Of course, we also have one of the season’s best episodes in “The Pegasus,” which manages to be the type of episode that really strikes the right balance of all of TNG‘s best individual pieces and tones. Anyway, have at it, and I’ll be back with “Lower Decks” and more in hopefully a week or so. And only now, near the very end of the reviews, do you decide to start using rotating pictures? Awww. I’ve heard so many things about Sub-Rosa now that I’m actually hyped. So bad it’s good episodes are excellent once in a while. Even the awful second season’s “Shades of Gray” was very fun to me, so I can’t wait to reach the 7th season and watch this crap, lol. Of course, I’m hoping for real good episodes as well, if there’s any. I was just thinking, it might be handy for guests to the site if you dated your reviews as well. I’m in the middle of rewatching DS9 and re-reading your reviews along with it. I just finished Improbable Cause/The Die is Cast and there was a few lines in there that jarringly reminded me the reviews were written right around the original air dates (in this case, 17 years ago!) or at least pre-Season 4 (“If part two lives up to this half, this may prove to be the best two-part arc of the series” made me chuckle, hehe. I do love that two parter though!). I understand all this because I’ve been coming here forever, but I imagine the average new user wouldn’t realise this at first. Anyway, it’s not very important and quite a big undertaking for such a small detail, but just a thought! Excited to read new reviews. I wonder what you’re watching lately? Game of Thrones? Walking Dead? I have to say, it’s a good time to be a TV watcher. @Brandon, I’ve used rotating pictures before. Just haven’t done it recently. I happened to make extra screenshots this week, so I used them. Basically, all of DS9 from season 3 on, all of Voyager, Enterprise, and Battlestar Galactica were written as the episodes aired. I had delays in there based on my schedule at the time, so reviews might’ve been written in some cases a few weeks or even months after the original airing. But for the most part, in real time or shortly thereafter for those shows. The exceptions: The first two seasons of DS9 I went back to review in 1997, before the sixth season of DS9 aired. The first season of BSG I wrote as the first season was being repeated before the second season started. And, of course, I wrote all the TOS reviews years after I started reviewing (in 1998, I believe), when Sci Fi aired them all. (This was, of course, before the days of DVD.) And, obviously, TNG, which I didn’t start reviewing until late 2005/early 2006 and should wrap up here shortly. What am I watching now? A fair amount of stuff, which should maybe be fodder for another blog. But among others, “Game of Thrones,” “Boardwalk Empire,” “Mad Men,” and catching up on “Breaking Bad” (I’m about 2/3 of the way through season 4, so, please, no spoilers). Quite a few comedy series as well. Always good to have new reviews. I’m doing an assignment in a class that’s not quite a review, but not an essay, and it’s good to have a place with good examples of reviews. by the way jammer the first 4 webisodes of blood and chrome are released allthough i don’t know if you are interested in reviewing webisode! perhaps you will wait for the movie on February? Jammer, have you watched Deadwood? If you haven’t, by all means: do. Quite simply one of the finest series ever aired. I suspect it’d make great review material for you as well, but even if you weren’t inclined to go that far, I can’t recommend it enough. “Deadwood” is the one series in the HBO Holy Trinity that I never watched. Maybe someday I will. I will probably get to “BSG: Blood and Chrome” eventually. I haven’t watched any of it yet and I’m not sure if I will give it a typical review treatment, but I’ll probably weigh in on some level hopefully soon. Just curious if you’re going to do an addendum to Measure of a Man and include the new extended footage. In a time when there is no Star Trek news, watching the extended Measure of a Man last night felt like watching a new episode. Hopefully you’ll get around to it, even though I know your feelings overall on retrospectives. I didn’t even realize there was a new extended version of “Measure of a Man,” which perhaps shows how out of the loop I am regarding Trek news. I assume that’s part of the new Blu-ray release? Either way, I don’t see going back for it, since I won’t be buying the Blu-rays anyway — though I am curious as to how the remastered Blu-rays look, especially with the (I assume mostly redone?) VFX shots. it’s looking much better jammer although the visual effects are not redone, they are just remastered in blu ray. But the series look so much better (you can see things that you couldn’t see in the old version or you couldn;t see well) that it deserves to watch it again. The reality regarding PUPPP, Pruritic Urticarial Papules and Plaques of being pregnant, is is it very irritating and extremely uncomfortable. The brilliant irritation a result of PUPPP could affect women when pregnant and during postpartum. The signs and symptoms are the same generally no individual who has experienced PUPPP has reported a nice experience with it. In conclusion, a 4-month treatment with a dietary supplement containing cinnamon, chromium and carnosine decreased fasting plasma glucose and https://rawsteroidsblog.wordpress.com/blog/ increased fat-free mass in overweight or obese prediabetic subjects, the researchers summarised. Whether the dietary supplement tested in this study can prevent the risk of type-2 diabetes and related complications remains to be established in larger studies with longer treatment and follow-up durations, using clinical endpoints.